The Casper Memorial Fund is set up to offset the cost of medical expenses for horses that require medical care above and beyond the ordinary. It is named for our Casper, the Ghost of a Friendly Horse. Casper came to us in December of 2006. Starved to a mere bag of bones, he still loved people. He and his stablemate were victims of a divorce. The husband left, didn't take his horses, and the wife refused to feed them. 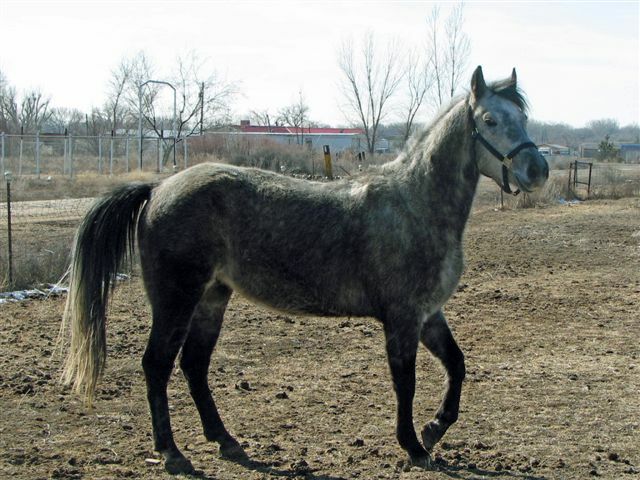 Casper's stablemate was already dead when the New Mexico Livestock Board was called in. Casper gained weight steadily, and his feet returned to health. Well mannered and friendly, Casper was a favorite of the volunteers. Everyone loved to brush him and spend time with him. He had a way of making you feel good. Finally, Casper was pronounced fit to enter the training phase, to prepare him for his life with a forever home. He went to the trainers, who gave glowing reports about him. She went so far as to say he was one of the two best horses she'd ever trained. Not because he was so perfect in conformation, but because he listened, and tried so hard to give what was asked. On the day before Casper was supposed to go to his new home, he colicked. The colic was discovered right away, and to the vet's office he went. There he underwent surgery, and was given a guarded prognosis. Casper tried to live for 5 days, and seemed to be improving. On the night of the 5th day, he couldn't make it anymore. He was a truly great horse, with plenty of life ahead of him, dead at the age of 7. This fund is for all the other horses that need the help Casper did. And so that Casper's death will not have been in vain. Thank you for giving what you can, so that other horses can benefit from Casper's life. You can make a donation to the Casper Memorial Fund with your credit card through PayPal without creating a PayPal account. It's quick and easy, and no strings attached!